Something interesting happened on Friday that I’m excited to share. I set up my middle school keyboarding class in a March Madness-like competition. The goal was to infuse class spirit and assess the kids’ typing speeds (we use Typing Master software). Students battled each other for the highest scores to move on to the next level of competition. This photo shows the finals. Incidentally, the two finalists are two of the youngest students in the class! The cheering was amazing — students were very supportive of their classmates during the competition. I don’t normally host such directly competitive events in my classroom. This, however, was a rousing success. I am glad I waited until the students had learned to touch type all (or nearly all) of their letters before this competition. While some students reverted to their hunt-and-peck ways, the two finalists are proud touch typists. 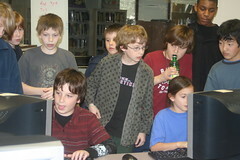 I found that younger students (middle school and younger) loved learning to type. They saw it as much as a skill game as a anything else. They had fun with it and while they knew at some level that it was useful they didn’t let that stop them from working on it. High school kids are just not happy with the idea at all. I came to believe that typing was a skiil best taught young. My Dad send my brother and I to typing school when we were in middle school back in the 60s. IT was very useful for us later in life of course but I doubt we’d ahve gotten as good at it if he had waited until we were in high school. You bring up a great point, Alfred. When should keyboarding be taught? I agree with you that high schoolers are, on the whole, not interested and are possibly beyond the age we can teach them to type. I used to think middle school was that age. Several years of teaching keyboarding has taught me otherwise. 7th grade is too late. But as I push keyboarding ever younger, I’m finding that 4th graders’ (my youngest students) hands are a bit small to touch type effectively. Leaning to type has such a passion and fun to it. Everything you do should be done with love and consideration the fact of the matter remains on the student weather he/she could accelerate and type with the magic fingers typing has always been a beauty to me this website should help and improve the typing skills allowing people to really challenge themselves. Playing games, and having fun is all what the theory of learning is have fun guys.Have fun!! !